I’m sure your family has some too. Legends. Myths. Epic Stories. Exaggerated fables. Things we talk about year after year and sadly or hysterically, pass on to our kids. For example, my father came to this country with $8 dollars. Sometimes that figure goes down slightly due to current market fluctuation, but it’s around that number. My sister and I would hear about how he got a job, an apartment, and a car solely with his work ethic and determination. “How did he take a taxi home from the airport?” “Where did he stay?” “How did he find a job?” we’d ask. But that wasn’t part of the story. A friend of mine told me that his Aunt Judy’s favorite story is about how her parents fell sick with the flu one winter and she and her brother (ages 5 and 7) cooked all their own meals for a week. This seems plausible if by “cooking” they mean making a peanut butter and jelly sandwich or a bowl of cereal. I could live on that for a week. And I have. My husband and I have continued this great parenting and child rearing technique. We tell our kids in vivid detail about the night my husband proposed (tears, laughter, and a man purse were involved). We tell them about how, as a young child in NYC, he tried to jump an open cellar on 87th street and missed (a trip to the ER and multiple stitches were involved). We tell them how he ended up at Billy Joel’s ranch in Long Island as a teenager and has dozens of pictures of Christie Brinkley to prove it (then they ask who Christie Brinkley is). I tell them about interning at “Live with Regis and Kathie Lee” and ironing Brad Pitt’s shirt because his luggage never made the flight in. I never met him. I handed the shirt to an assistant producer who handed it to a producer who then gave it to his agent to give to him. But it’s like I basically touched Brad Pitt. What’s great is that now my kids have their own family legends to tell. My daughter was born in the hospital room next to Al Roker’s wife giving birth to his first daughter. This was the pre stomach reduction Al. My mother rode down the elevator with Al and in her beautiful accented English regaled him for minutes with the marvelous coincidence. He was nice and nodded. Year’s later, while we were vacationing in Montauk – we had another legendary incident. On a particularly cloudy afternoon, we decided to skip the beach and go bowling. Before we hit the ally, we stopped for pizza in a small town outside of the Hampton’s. I don’t remember if I’ve told the story before – so I won’t go into the details now – but that’s when we ran into and had our 1.8 minute conversation with Sir Paul McCartney. Epic. This past week, while on vacation, we added to one of our legends. My husband went back to work a few days into our week at the lake. He texted me from the train that sitting in the car in front of him, blocked for privacy, was none other than Al Roker – post stomach reduction. Apparently he has a house just miles from where we were staying (that’s what it said on the internet). I begged him to take a picture or start a conversation with our old friend Al. It could go something like,” hey! Remember me? I fathered the kid that was born next to your kid.” or “Hi, small world! We have our firstborn together and now this!”. He refused. 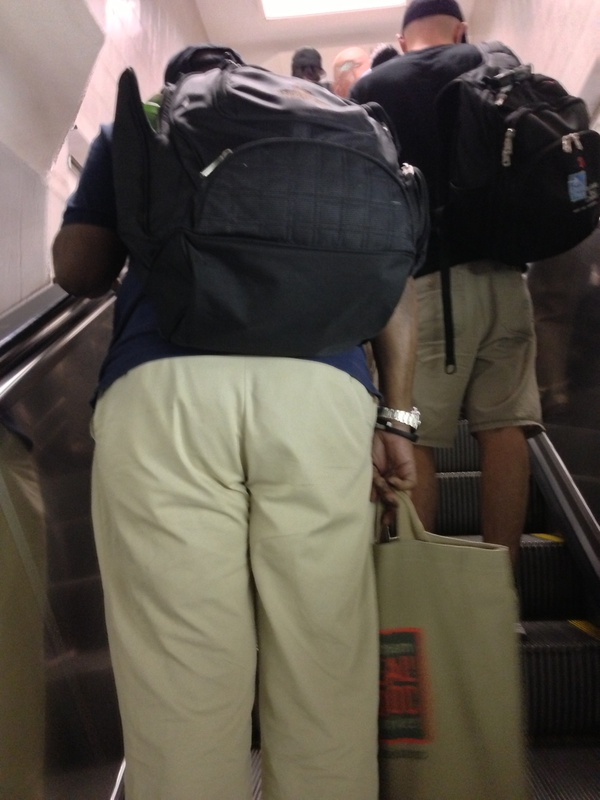 He did however stalk him off the train and get this shot going up the escalator at Penn Station. This picture is going right in the photo album.